It’s firing season in the NFL! We’re keeping track of all the news and rumors here as teams make moves. The NFL regular season is over and we’re on to the playoffs. But for a few of the league’s other teams, it’s time to embark on a second season too — firing and hiring season. Two teams, the Browns and the Packers, fired their head coaches during the season. The Jets and Bucs followed suit on Sunday. The Broncos, Bengals, Dolphins, and joined them in 24 hours. Even more of the NFL’s 32 franchises could be spinning on the coaching carousel looking to replace coordinators and assistant coaches. So far, all the teams have either filled their head coaching vacancy or have a candidate they plan to hire. First up was the Packers, who brought on Matt LaFleur. The Buccaneers then lured Bruce Arians out of retirement, and the Cardinals saved Kliff Kinsgbury from USC. After that, the Browns elevated Freddie Kitchens to head coach, and Adam Gase, who’s staying in the AFC East, is now in charge of the Jets. The Broncos bucked the offensive trend and went with a defensive mind, Vic Fangio. The other two hirings aren’t official and can’t be until the current teams of the soon-to-be coaches are done with their season. The Bengals are expected to hire Rams QBs coach Zac Taylor, while the Dolphins are zeroing in on Patriots defensive playcaller Brian Flores. We’re keeping track of the latest news and rumors as teams start making changes. Keep checking back. Dec. 31: Wilks reportedly told his staff Monday morning that he would not be coaching, Ian Rapoport of the NFL Network reported. The Cardinals made it official shortly after. 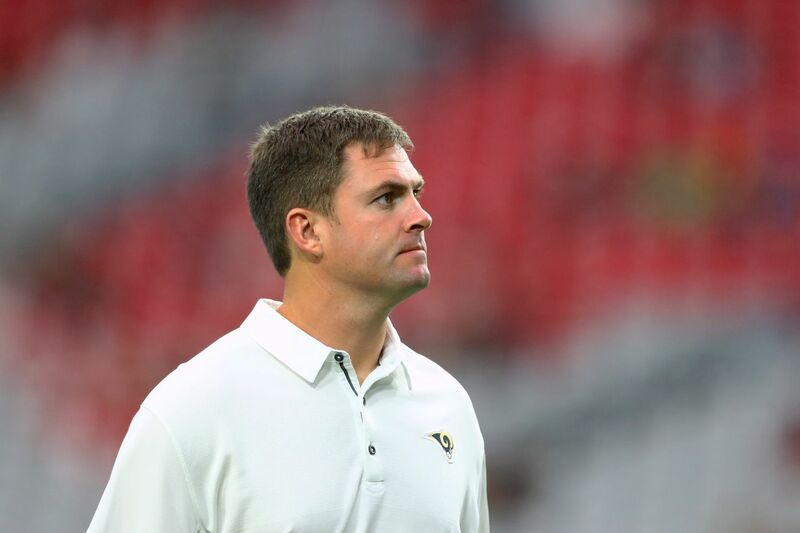 Dec. 31: The Cardinals will interview Rams QB coach Zac Taylor, Chiefs OC Eric Bieniemy, and Saints assistant Dan Campbell. Dec. 31: The Cardinals also fired OC Byron Leftwich and DC Al Holcomb. Jan. 1: Recently fired Dolphins coach Adam Gase will interview with the Cardinals on Wednesday. Jan. 1: The Cardinals will interview former Texas Tech head coach Kliff Kingsbury. Jan. 2: Bieniemy has decided not to interview with the Cardinals. Jan. 4: Former Lions and Colts coach Jim Caldwell completed his interview with the Cardinals. Jan. 5: USC won’t let Kliff Kingsbury interview with the Cardinals, and now Kingsbury might resign. Jan. 7: Suddenly, Kingsbury is meeting with NFL teams. Jan. 8: And just like that, Kingsbury is the new coach in Arizona. Jan. 10: Everyone will be watching who Kingsbury hires as his defensive coordinator. One candidate: Vance Joseph. Another: Chuck Pagano. Jan. 10: Former Giants coach Ben McAdoo will interview with the Cardinals for a position on the coaching staff. Jan. 10: Steve Sarkisian, recently fired as the Falcons OC, interviewed for the same position with the Cardinals. Jan. 11: Josina Anderson reports Arizona will make recently deposed Broncos head coach Vance Joseph Kingsbury’s defensive coordinator. Jan. 11: Steve Sarkisian is “closing in” on the OC gig. Jan. 12: Although he was reportedly offered the OC job with the Cardinals, Steve Sarkisian is headed back to college — specifically, back with Nick Saban at Alabama. Jan. 13: After Sarkisian turned them down, the Cardinals are bringing in former Vikings OC John DeFilippo for an interview. Jan. 15: Jim Bob Cooter is also interviewing for the OC job. A Jim Bob and a Kilff? What a staff of names that would be. Dec. 31: The Falcons fired Sarkisian, Manuel, and special teams coach Keith Armstrong. Quinn will take over defensive coordinator duties, while former Texans and Broncos coach Gary Kubiak could be a candidate for the OC job. Former Seahawks OC Darrell Bevell will also interview for the position. Jan. 1: Dirk Koetter, freshly unemployed, will interview for a familiar position: Falcons OC. Jan. 2: Mike Mularkey, another former Falcons OC, and another former NFL head coach, interviewed for his old job. Jan. 6: The Broncos won’t let the Falcons take a look at Kubiak. Jan. 7: The Falcons have offered Dirk Koetter his old job back. Jan. 8: Koetter is back as OC, and another former head coach, Mike Mularkey, is the Falcons’ new tight ends coach. Dec. 30: At least one team will consider calling the Ravens to see if they’d be willing to trade Harbaugh, according to Adam Schefter. The Dolphins and the Broncos are two teams reportedly considering a trade for Harbaugh, if the Ravens are interested, according to Pro Football Talk. Jan. 6: The Ravens reportedly want Harbaugh back, even as a pair of teams work to pry him out of Baltimore. Jan. 6: Harbaugh doesn’t think he’s going anywhere, as he told reporters after the Ravens’ Wild Card loss to the Chargers, but he’s not 100% sure. Jan. 7: Harbaugh and the Ravens are working toward a long-term extension. Jan. 11: Greg Roman has been promoted to OC, while Marty Mornhinweg is out. The Bills went from a playoff team to 6-10, mostly thanks to a moribund offense that was 30th in points and yards. Their defense, on the other hand, finished the season No. 2 overall. So it’s not surprise that their coaching changes have come on the offensive side. Jan. 1: The Bills fired offensive line coach Juan Castillo. Jan. 2: Wide receivers coach Terry Robiskie won’t be back, either. Jan. 3: Special teams coordinator Danny Crossman, who had been with the Bills longer than any current coach, is also out. Jan. 15: Bobby Johnson, who served as the assistant OL coach with the Colts, is the Bills’ new OC. Jan. 4: The Panthers parted ways with wide receivers coach Lance Taylor (someone get Steve Smith on the phone). Jan. 10: Former Colts Chunk Pagano is meeting with the Panthers about an unnamed role with the team, which seem like an odd fit. The Bears need a new defensive coordinator now that Vic Fangio is finally getting his shot at a head coaching role with the Broncos. Jan. 11: Former Colts head coach Chuck Pagano met with Chicago executives regarding the club’s open DC role. Soon after, he was officially hired. And that’s it for the Marvin Lewis era in Cincy. He’s gone. Dec. 31: Lewis is out. He informed his coaching staff of the decision on Monday morning. Dec. 31: Lewis endorsed Hue Jackson to replace him (don’t do it, Bengals). Other in-house candidates include special teams coach Darrin Simmons and OC Bill Lazor. Dec. 31: The Bengals have also contacted outside candidates, like Rams QB coach Zac Taylor and Rams TE coach Shane Waldron. Dec. 31: The club is also interested in Patriots OC Josh McDaniels. Jan. 1: Vance Joseph will get an interview with the Bengals just days after being fired by the Broncos. Joseph spent two seasons in Cincinnati as the DBs coach. Jan. 2: The highly popular Eric Bieniemy, currently OC for the Chiefs, will meet with the Bengals. Jan. 2: Well, Hue Jackson is getting his head coaching interview in Cincinnati. Jan. 3: Josh McDaniels won’t be interviewing with the Bengals. Jan. 3: The Bengals added a new candidate after McDaniels declined to be interviewed: Bucs OC Todd Monken. Jan. 10: The Bengals have been relatively quiet, but one report say they’re looking to make an offensive-minded, outside hire. Jan. 10: Did someone say offensive-minded, outside hire? Well it looks like it’s true: the Bengals plan to hire Rams QBs coach Zac Taylor. Look at those Ohio teams, trying something new. Jan. 11: With Zac Taylor expected to get the head coaching job, the Bengals let OC Bill Lazor go. Jan. 11: It shouldn’t be a surprise that Hue Jackson is gone as well. Dec. 30: Both Jay Glazer and Ian Rapoport reported that Gregg Williams will be out after the season. Cleveland.com’s Mary Kay Cabot thinks that both Harbaugh brothers could be in play for the Browns’ head coaching job. Dec. 30: The Arizona Republic’s Bob McManaman says it’s already a done deal that former Packers coach Mike McCarthy will be the Browns’ next head coach, though Cabot reported that the Browns have simply “reached out” to McCarthy. Dec. 31: Adam Schefter reports that the Browns have requested permission to interview Brian Flores, Patriots defensive coordinator. Dec. 31: The Browns will interview Freddie Kitchens for the head coaching job, Mary Kay Cabot reported. They’ll also give Gregg Williams a formal interview and then chance to explain why his 5-3 record as interim head coach qualifies him for the full-time job. The Browns confirmed they will interview both. Dec. 31: Recently fired Dolphins coach Adam Gase is also reportedly in the mix, which will go over very smoothly with former Miami WR Jarvis Landry, who is now the Browns’ WR1. Dec. 31: Saints tight ends coach Dan Campbell, who once led the Dolphins to a 5-7 record as interim head coach, is getting an interview with Cleveland. Dec. 31: The Browns must like what the Colts are doing. They’ve requested interviews with both of the Colts’ coordinators: OC Nick Sirianni and DC Matt Eberflus. Dec. 31: Vikings interim OC Kevin Stefanski will also get an interview for the Browns’ head coaching job. Dec. 31: The Browns have shown interest in former Colts/Lions coach Jim Caldwell, though as of now, there’s no formal request for an interview. Jan 1: Mike McCarthy will officially interview with the Browns. Jan. 2: Interim head coach Gregg Williams got his formal interview with the club, as did Jim Caldwell. Jan 3: Other teams are trying to poach OC Freddie Kitchens, who will get his chance to interview for the Browns’ head coaching job next week. Even if he doesn’t get the job, Cleveland would want its new coach to have the opportunity to retain Kitchens. Jan. 3: The Browns completed their interview with Kevin Stefanski. Jan. 7: Freddie Kitchens, whose work as interim offensive coordinator helped unlock Baker Mayfield’s potential and turn him into a rookie of the year frontrunner, has got a real shot at the Browns’ top job. Jan. 7: The Browns are backing away a little from Mike McCarthy while they focus on other candidates. Jan. 8: Cleveland is reportedly down to two finalists: interim offensive coordinator Freddie Kitchens and Vikings interim offensive coordinator Kevin Stefanski. Jan. 9: Wow, the Browns really did it. Freddie Kitchens is their next coach. Most of the coaching staff, including former interim coach/DC Gregg Williams and OL coach/Hard Knocks star Bob Wylie, will not return. Jan. 10: With Kitchens now the head coach, the Browns need a new offensive coordinator. One candidate is Todd Monken. Jan. 10: Former Lions OC, and NFL name champion, Jim Bob Cooter will also interview for the Browns’ offensive coordinator position. Jan. 10: The Browns also have a defensive coordinator opening, and Vance Joseph is already set to interview for it. They’re also interested in Chuck Pagano. Jan. 11: With Joseph going to the Cardinals, the Browns are primed to interview another recently fired head coach to take over at DC — this time, it’s former Arizona coach Steve Wilks. Jan. 11: Mike Priefer is going from Vikings special teams coordinator to Browns special teams coordinator. Jan. 11: The Browns are expected to hire Steve Wilks as their new defensive coordinator. Jan. 13: In addition to Wilks, the Browns found their other new coordinator: former Bucs OC Todd Monken. That’s quite the staff in Cleveland. Jan. 14: The Browns announce their new staff, including Wilks, Monken, Stump Mitchell as running backs coach, and Ryan Lindley as quarterback coach. Jan. 16: Kitchens added another impressive hire to his list — this time stealing Alabama DC Tosh Lupoi away to coach his defensive line. Jan. 10: Cowboys defensive coordinator Rod Marinelli is hoping Dallas can keep Kris Richard around. Jan. 14: Jason Garrett said he isn’t planning any major coaching staff changes, and that includes keeping Scott Linehan around as OC — but then he quickly forgot about that and said no decisions had been made, after a talk with the Joneses. So maybe Linehan’s job isn’t safe. Jan. 15: Just one more thing: Marc Colombo is returning to Dallas as the new OL coach. Jan. 18: OC Scott Linehan got fired despite Garrett’s best efforts. Vance Joseph made a pretty good case for why the Broncos should fire him back in Week 9 when he made one of the worst coaching decisions of his short career (and there are a lot to choose from). But then the Broncos went on a three-game win streak and had the easiest path to an AFC Wild Card bid. That would have made it impossible for John Elway to fire him. Nope. Joseph’s Broncos went out and lost the next three, kicking them firmly out of postseason contention. As expected, they fired Joseph the day after the season ended. Dec. 31: He’s out. Fired. Dec. 31: Schefter reports that the Broncos have requested permission to interview Brian Flores and former Titans head coach and Steelers OL coach Mike Munchak. Dec. 31: The Broncos have asked to interview Bears DC Vic Fangio, though it’ll have to wait with his team set to play on Wild Card Weekend. Dec. 31: Don’t expect the Broncos to go back to the Adam Gase well or the Mike Shanahan well. Former coach Gary Kubiak could be an OC candidate, however. Dec. 31: John Elway denied the Broncos were looking to bring back Mike Shanahan, but he didn’t deny they’d be willing to trade draft picks for a coach. If so, John Harbaugh could be a candidate. Right now, though, that doesn’t look likely. Dec. 31: Rams quarterbacks coach Zac Taylor will have the chance to convince Elway he’s the right guy to dig the Broncos’ offense out of its current hole. Dec. 31: The team is expected to interview former Colts coach Chuck Pagano, though it has not formally requested to do so yet. Jan. 2: Pagano will be the first candidate to interview with the Broncos, followed by Taylor, Munchak, Flores, and Fangio. Jan. 5: Mike Munchak, who already met with the Broncos, has a lot of interest in the job. Jan. 6: Gary Kubiak is a major part of the Broncos’ rebuilding plans; the club isn’t allowing him to interview for OC jobs anywhere else in the league. Jan. 8: The Broncos seem to be down to either Vic Fangio or Mike Munchak, with Fangio looking like the frontrunner. Jan. 9: 60-year-old Vic Fangio is a head coach for the first time. Jan. 10: Gary Kubiak is expected to return to the Broncos coaching staff as the OC. Jan. 11: Welp, now Gary Kubiak will NOT be the OC. Jan. 11: Mike Munchak didn’t get the head coaching job, but the Broncos still want to hire him, perhaps as OL coach. Jan. 11: With reports that the Broncos were looking for an innovative offensive mind, they tried to set up one interview for the OC job: 49ers QB coach Rich Scangarello. The 49ers denied the request. Jan. 14: Mike Munchak is joining the Broncos after all … as the OL coach. Jan. 15: Rich Scangarello is expected to be the new OC, while former Bears secondary coach Ed Donatell is following Vic Fangio to Denver to become his new DC. Jan 1: Yep, Jim Bob Cooter is out. Jan. 16: And former Seahawks OC Darrell Bevell is in. Dec. 30: The Packers are going to kick the tires on both New England’s coordinators, asking for permission to interview Josh McDaniels and Brian Flores as they turn over every single stone in their coaching search. Dec. 31: Saints tight ends coach Dan Campbell, who once led the Dolphins to a 5-7 record as interim head coach, will be interviewing in Green Bay as well. Dec. 31: Steelers OL coach Mike Munchak will interview with the Packers, in addition to the Broncos. Dec. 31: Titans OC Matt LaFleur will also get a chance to impress Green Bay’s brain trust. Jan. 3: Pat Fitzgerald won’t interview with the Packers — or any other NFL team. Jan. 4: Brian Flores is set for his interview with the Packers, his second of four interviews in a two-day span. Jan. 4: Next up for Adam Gase: an interview with the Packers. Jan. 5: The Packers were busy Saturday, interviewing Bucs OC Todd Monken, Saints OC Pete Carmichael, and Saints assistant head coach Dan Campbell. Jan. 7: HERE WE GO. The Packers are going to hire Matt LaFleur — and it might be brilliant? Jan. 10: Get out the water skis: Ron Zook is a free agent after being let go as special teams coordinator. Jan. 11: Former Bucs OC Todd Monken and former Jaguars OC Nathaniel Hackett will both interview for the Packers’ offensive coordinator opening. Jan. 11: Defensive coordinator Mike Pettine will return. Jan. 12: The 49ers wouldn’t let the Packers interview their WRs/passing game coach — who also happens to be Matt LaFleur’s brother, Mike. Jan. 14: Nathaniel Hackett, just hired as the Packers’ new OC, gets to upgrade from Blake Bortles to Aaron Rodgers. The Colts were ahead of schedule, taking a 1-5 start and turning it into a spot in the Divisional Round of the playoffs. That’s where the season ended, but the future is still bright. Surely there won’t be many coaching changes, right? Especially with an OL that protected Andrew Luck more than he ever has been in his career? Dec. 30: Jaguars owner Shad Khan said that Doug Marrone, Tom Coughlin and general manager Dave Caldwell are safe for the 2019 season. Dec. 31: The Jaguars did fire a few positional coaches: Tyrone Wheatley, who was in charge of a dysfunctional running backs room, as well as Perry Fewell (secondary), Pat Flaherty (OL), and Marion Hobby (DL). Jan. 10: Todd Monken talked to the Jaguars about their OC position, though he’s still taking interviews elsewhere. Jan. 12: After Gary Kubiak decided not to take the Broncos’ OC job, he could be a candidate for the same position with the Jaguars. Jan. 14: The Jaguars interviewed John DeFilippo for OC. Next up is Kubiak. Jan. 15: Longtime NFL coach Terry Robiskie will be the new RBs coach in Jacksonville. Jan. 15: Mike McCoy, who was fired midseason as Cardinals OC, is getting an interview for the same position with the Jaguars. Jan. 16: The Jaguars are expected to hire Vikings interim OC John DeFilippo in hopes to reviving their awful offense. Despite a 7-9 record, there was some speculation that Gase would be spared. He was not. The Dolphins fired him Monday morning after the season ended. The team is expected to move on from quarterback Ryan Tannehill, which means a new coach will get the chance to pick his own QB. Dec. 31: Gase may be back, but maybe not before Ross checks to see if he can get either Jim or John Harbaugh to be his team’s next coach, according to Peter King. Dec. 31: Gase was fired. Dec. 31: The Dolphins have asked for permission to interview Patriots de facto defensive coordinator Brian Flores. Dec. 31: Longtime NFL defensive coordinator Vic Fangio, currently with the Bears, will interview with the Dolphins. Dec. 31: Add the Dolphins to the list of teams that will interview Steelers OL coach Mike Munchak. Dec. 31: The Dolphins have also been in touch with Chiefs OC Eric Bieniemy, arguably the hottest name on the coaching market. Dec. 31: Cowboys passing game coordinator and defensive backs coach Kris Richard will also be getting an interview in South Beach. Jan. 4: Brian Flores’ first of four interviews will start with the Dolphins. Jan. 4: The Dolphins will be the first team to interview Saints DC Dennis Allen. Jan. 4: A new candidate emerges in the Dolphins’ head coach search — Baltimore head coach John Harbaugh, who would have to be acquired via trade. Jan. 7: Bears DC Vic Fangio won’t interview with Miami after all. Jan. 9: Kris Richard could be the favorite. Jan. 10: Wait, maybe Brian Flores is the favorite. Jan. 11: The Dolphins will be interviewed two in-house candidates: offensive coordinator Dowell Loggains and special teams coordinator Darren Rizzi. Jan. 11: Brian Flores is the Dolphins’ target, though there’s no deal yet (and can’t be until the Patriots’ season is over). Jan. 14: Former Lions coach Jim Caldwell is expected to join Flores’ staff as an associate head coach. Dec. 31: Despite a rough finish that pushed Minnesota out of the playoffs, the Vikings will retain head coach Mike Zimmer. Jan. 2: Good news for Bengals fans: Hue Jackson is a candidate for the Vikings’ OC job. Jan. 7: Dirk Koetter has entered the mix to be next OC in Minnesota. Jan. 9: The Vikings are making Kevin Stefanski the full-time OC. Jan. 12: The 49ers keep denying requests, including the Vikings wanting to interview 49ers passing game coordinator Mike LaFleur. Jan. 14: Gary Kubiak is met with the Vikings, where his son is the new QBs coach, and wham, he’s hired to be an offensive advisor. Bill Belichick isn’t going anywhere … but his highly-regarded assistants might be. Jan. 7: Reports suggest New England could be targeting USC OC Kliff Kingsbury to replace Josh McDaniels should the sought-after coordinator leave for a head coaching job. Jan. 8: Josh McDaniels isn’t going anywhere, saying “the book is closed” on any more interviews. It’s hard to believe, four seasons later, that Todd Bowles won 10 games in his first year (2015) as the Jets head coach, thanks in part to a little bit of the old FitzMagic. Little did we know that the team’s choke job in a Week 17 loss with the playoffs on the line that season would set the tone for the rest of Bowles’ 24-40 tenure there. The opinion of the league’s most well-informed insiders is that Bowles is as good as gone as soon as the season ends. Dec. 30: As expected, Bowles was fired. Dec. 31: If Jim Harbaugh isn’t coming east, Eric Bieniemy might be. The Jets have requested permission to interview the Chiefs’ OC. Dec. 31: The Jets will also interview former Seahawks DC, and current Cowboys DBs coach, Kris Richard. Dec. 31: Add another name to the interview list: Todd Monken, the Bucs’ current OC and former Southern Miss head coach. Dec. 31: The Jets have interest in Jim Caldwell, but they haven’t requested an interview yet. Dec. 31: Iowa State coach Matt Campbell declined an interview request from the Jets. Jan. 1: Former Green Bay head coach Mike McCarthy is getting an interview in New York. Jan. 1: Former Texas Tech head coach and current USC offensive coordinator Kliff Kingsbury will get an opportunity to interview with the Jets. Jan. 2: The Jets are one of four teams that will interview Bieniemy. Jan. 2: Adam Gase will get another shot with another AFC East team, interviewing with the Jets less than a week after getting fired by the Dolphins. Jan. 4: The Jets have shown interest in Baylor coach Matt Rhule, though it might not be anything beyond that right now. Jan. 5: Adam Schefter reported that USC is denying the Jets permission to interview Kliff Kingsbury. As a result, Kingsbury could resign. Jan. 5: Mike McCarthy officially interviewed with the Jets — and he could be the favorite. Jan. 7: The Jets get the first crack at Kliff Kingsbury. Jan. 8: Mike McCarthy only wants the Jets job. Jan. 9: Sorry, Mike McCarthy. Adam Gase gets the gig. Vance Joseph could join him in New York as DC if he doesn’t get the Bengals job. Jan. 10: Gregg Williams is also a candidate for the DC position. Jan. 11: The Jets are reportedly on the verge of hiring Williams, who received little interest as a head coach this winter despite a 5-3 record as the Browns’ interim HC in 2018. Jan. 16: Gregg Williams signed a three-year deal to become New York’s defensive coordinator. The Raiders don’t have a head coaching search with Jon Gruden still having nine years left on his contract, but they do need a general manager after firing Reggie McKenzie. NFL Network’s Mike Garafolo said that NFL Network’s Mike Mayock has come up in discussions and he’s already interviewed with Oakland for the gig. Dec. 31: It’s done. The Raiders are hiring Mayock to be their next general manager, Adam Schefter reported Monday morning. Jan. 2: The Raiders aren’t just moving on from Reggie McKenzie. They also fired McKenzie’s No. 2, Joey Clinkscales. Jan. 3: Ryan Grigson, who didn’t fare so well as Colts general manager, will reportedly meet with the Raiders about a front office gig. Raiders fans aren’t thrilled about it. Jan. 4: Linebackers coach Joey Porter, who helped drop Marvin Lewis to 0-7 in the playoffs by running onto the field and drawing a key unsportsmanlike conduct penalty on the Bengals back in 2017, will not return to the team in 2019. Jan. 7: The Steelers also parted ways with running backs coach James Saxon. Jan. 10: The Steelers aren’t expected to make any changes at DC. Jan. 11: Former Lions and Bengals DC Teryl Austin is headed to Pittsburgh as the new secondary coach. Jan. 14: After losing Mike Munchak to the Broncos, the Steelers promoted Shaun Sarrett to be their new OL coach. The Buccaneers fired Koetter right after their season concluded with a 34-32 loss to the Falcons. Earlier in the day it was reported that the team would be bringing back quarterback Jameis Winston in 2019 to be their expected starter. Dec. 30: Koetter is fired. Dec. 31: Former Cardinals coach Bruce Arians told Ian Rapoport he “would listen” if the Bucs reached out. Dec. 31: There hasn’t been much from the Bucs so far, but one name that has piqued their interest is Chiefs OC Eric Bieniemy. Jan. 1: The Bucs have asked to interview Vikings DC George Edwards. Jan.2: Notre Dame head coach Brian Kelly has drawn interest from Tampa Bay, according to reports. Jan. 2: One of Bieniemy’s first interviews will be with the Bucs. Jan. 2: Kris Richard, another popular coaching candidate, will also interview with the Bucs after the Cowboys play the Seahawks. Jan. 5: Former Cardinals coach Bruce Arians met with the Bucs and could be a favorite to land the job. Jan. 6: Arians-to-Tampa reports are picking up more steam. Jan. 8: The Bucs made it official and announced the hiring of Arians, who is expected to reunite with Todd Bowles (as DC), Byron Leftwich (as OC), and Harold Goodwin (assistant HC).